I recently published a list of the books that had made the biggest impact on me, personally, over the last ten years. I left one book out of that list – the book that impacted me even more than any of the others. The book in question was authored by Dr James J. Hughes, a sociologist and bioethicist who teaches Health Policy at Trinity College in Hartford, Connecticut. In his spare time, James is the Executive Director of the IEET – the Institute for Ethics and Emerging Technologies. 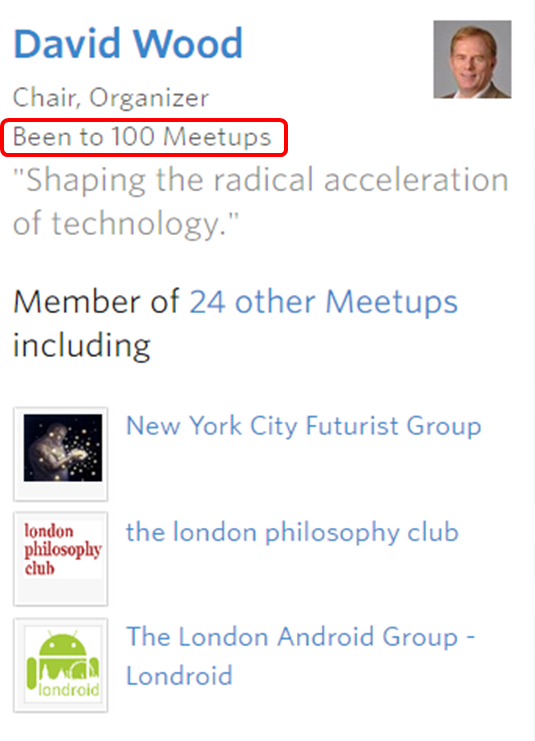 Making plans for a significant one-day event in London on 24th April, “Humanity+, UK 2010” – a conference on the future of technology and the future of humanity. When I look back at the book in 2010, I find several key ideas in it which I now take for granted (but I had forgotten where I learned them). An indication of the ideas contained may be found from an online copy of the Introduction to the book, and from a related essay “Democratic Transhumanism 2.0“. The book goes far beyond just highlighting the potential of new technologies – including genetic engineering, nanotechnology, cognitive science, and artificial intelligence – to significantly enhance human experience. The book also contains a savvy account of the role of politics in supporting and enabling human change. This book argues that transhuman technologies – technologies that push the boundaries of humanness – can radically improve our quality of life, and that we have a fundamental right to use them to control our bodies and minds. But to ensure these benefits we need to democratically regulate these technologies and make them equally available in free societies. Becoming more than human can improve all our lives, but only new forms of transhuman citizenship and democracy will make us free, more equal, and more united. I’ve just finished a review copy of James Hughes’s “Citizen Cyborg: Why Democratic Societies Must respond to the Redesigned Human of the Future.” I was skeptical when this one arrived, since I’ve read any number of utopian wanks on the future of humanity and the inevitable withering away of the state into utopian anarchism fueled by the triumph of superior technology over inferior laws. Hughes’s remarkable achievement in “Citizen Cyborg” is the fusion of social democratic ideals of tempered, reasoned state intervention to promote equality of opportunity with the ideal of self-determination inherent in transhumanism. Transhumanism, Hughes convincingly argues, is the sequel to humanism, and to feminism, to the movements for racial and gender equality, for the fight for queer and transgender rights — if you support the right to determine what consenting adults can do with their bodies in the bedroom, why not in the operating theatre? The transformation of politics Hughes envisions is from a two-dimensional classification to a three-dimensional classification. 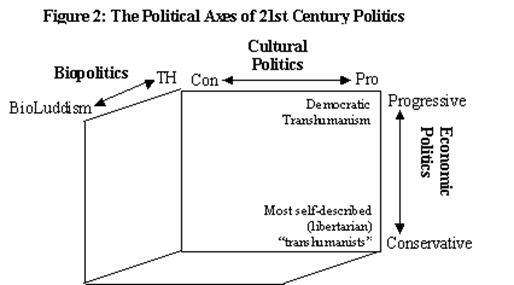 The first two dimensions are “Economic politics” and “Cultural politics”, with a spectrum (in each case) from conservative to progressive. The new dimension, which will become increasingly significant, is “Biopolitics”. Hughes uses the label “bioLuddism” for the conservative end of this spectrum, and “Transhumanism” for the progressive end. The resulting cube has eight vertices, which include both “Left bioLuddism” and “Right bioLuddism”, as well as both “Libertarian transhumanism” and “Democratic transhumanism”. Interestingly, the ramp-up of political debate in the United Kingdom, ahead of the parliamentary election that will take place some time before summer, has served as a reminder that the “old” political divisions seem inadequate to deal with the challenges of the current day. It’s harder to discern significant real differences between the major parties. I still don’t have any strong views as to which party I should vote for. My guess is that each of the major parties will contain a split of views regarding the importance of enhancement technologies. The most important disagreement between bioLuddites and transhumanists is over who we should grant citizenship, with all its rights and protections. BioLuddites advocate “human-racism”, that citizenship and rights have something to do with simply having a human genome. Transhumanists… believe citizenship should be based on “personhood”, having feelings and consciousness. The struggle to replace human-racism with personhood can be found at the beginnings and ends of life, and at the imaginary lines between humans and animals, and between humans and posthumans. Because they have not adopted the personhood view, the human-racists are disturbed by lives that straddle the imaginary human/non-human line. But technological advances at each of these margins will force our society in the coming decades to complete the trajectory of 400 years of liberal democracy and choose “cyborg citizenship”. On Saturday afternoon (15th August), I’ll be chairing a meeting in Central London on the topic, “The future of energy: Leadership and technological innovation”. The speaker is James Woudhuysen, Professor of Forecasting & Innovation, De Montfort University, Leicester, UK. I’ve seen James speak several times over the years, and he’s always both entertaining and thought-provoking. The talk will cover some of the same ground as the recent book “Energise – A future for energy innovation” which James co-authored with Joe Kaplinksy. This is a refreshing and a required read for anybody … bored with the idea of merely surviving, and confident that human beings can still make a much better world. I’m expecting a lively debate! The future of energy is a critically important topic, for all kinds of reason. If you think you might like to attend, there are more details on the event blog.